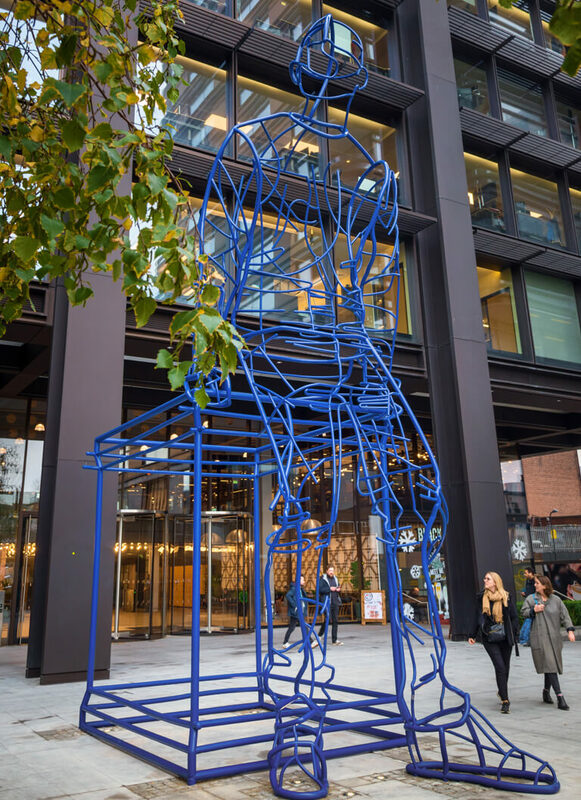 Inspired by the limitless possibilities of our next thought, move and action, the towering ultra-marine blue steel sculpture boldly nods to the non-conformist creative sentiment so deeply ingrained within the cultural identity of Shoreditch. Echoing a seemingly playful hand drawn sketch, the waiting figure appears to have descended from its plinth and is perched against it. Leaning forward expectantly with its head looking back towards the high street, this piece captures themes of suspense, vulnerability, optimism and possibility. Playing with the notion of the traditional statue standing atop a plinth, this work suggests that in our defining moments - the likes of which would see us immortalised on such a pedestal - we are more vulnerable than the traditional depictions may suggest. Here the figure is shown surrendering this mighty pose, stepping down from their stage in a more relatable human moment of contemplation, apprehension and hope. In Anticipation offers the beginning of a story, and invites the viewer to create his or her own narrative surrounding the figure.